1960 (MCMLX) is 60th year of the 20th century, and the 1st year of the 1960s decade. It is also known as the "Year of Africa" because of major events—particularly the independence of seventeen African nations—that focused global attention on the continent and intensified feelings of Pan-Africanism. November 2 – Penguin Books is found not guilty of obscenity in the trial R v Penguin Books Ltd, the Lady Chatterley's Lover case. 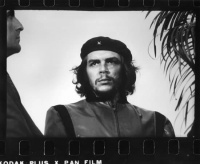 Alberto Korda takes his iconic photograph of Ernesto "Che" Guevara. Unless indicated otherwise, the text in this article is either based on Wikipedia article "1960" or another language Wikipedia page thereof used under the terms of the GNU Free Documentation License; or on original research by Jahsonic and friends. See Art and Popular Culture's copyright notice. This page was last modified 13:23, 1 January 2019. This page has been accessed 11,149 times.